I like American bison because they are a big strong animal, that look very tough and intimidating. American bison are the largest land mammal in North America. Males have been measured at up to 3.5 metres long, 1.8 metres high and they can weigh up to 1,270 kilograms. Despite their large size, they are amazing athletes. They are very fast, running at 40 miles per hour and can jump up to 6 feet off the ground. Because of their size, they have very few predators, with only a pack of wolves considered a threat in the wild. The wolves target the calves, which are then protected by the adults in the herd, who form a ring around them. Bison are well equipped for life in the cold. They have thick fur and are able to use their horns to move snow so that they can eat the grass underneath. They are one of the first great conservation success stories. When Europeans first arrived in North America, there were over 30 million bison roaming around. Due to over-hunting, this number was reduced to just over 500 in the 1800’s. Ranchers saved the remaining animals and now there are over 500,000 alive. Despite this recovery, the American bison’s status is near threatened, meaning that we still have to look after them. 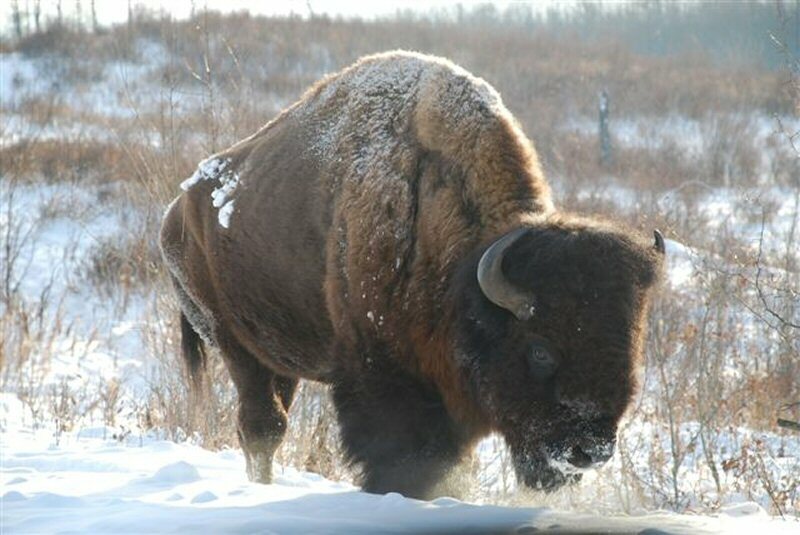 Are there any other interesting facts that you would like to share about American bison?